As a professional nail technician, it is paramount that you familiarise yourself with all parts of nail anatomy to ensure you are offering your clients a professional and thorough service. The function of the nail is to protect the outermost bone of the finger or toe, the fingertip, and the surrounding soft tissues from injuries. The fingertips contain a lot of sensory endings that allow us to distinguish touch, pain and temperature. As these nerve fibres are very sensitive and fragile, it is important to protect these. The underside of the finger is fleshy and the nail covers the pad-like topside. The nail plate is designed to crack or break off under pressure or upon impact to act as a shock absorber so the nail bed and nerve endings should be exposed to minimal damage only. The cells originate in the matrix and move forward towards the fingertips. When they first become exposed from under the cuticle, the cells are soft and spongy and only harden and keratinise when exposed to the air. This usually takes several days. The nail continues to grow forwards in the shape and width of the nail bed. When the nail plate extends beyond the hyponychium, this becomes the free edge. It is important to have a free edge as this ensures that all the nail bed is covered and therefore protected. The cuticle is the strip of hardened, ‘flakey, dry’ skin found on the nail plate, above the eponychium, at the base of a nail. What majority of people consider the cuticle is actually the living tissue, the eponychium. It acts as a barrier to prevent pathogens from entering the soft tissue. The skin fold that ends at the base of the nail plate. This area should be treated with care. Infection can occur if the matrix seal is broken. 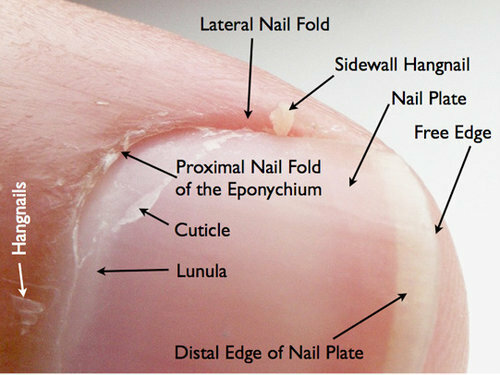 The hyponychium is the tissue under the free edge of the nail that seals the nail plate to the tip of the finger. This acts as a seal to prevent pathogenic bacteria from entering the finger. Some client will have a condition called ‘extended hyponychium’ where this skin protrudes the nail plate and tip of the finger. You must treat these clients’ nails with care as this can become painful if the nail is filed too short. The nail bed is located under the nail plate. It starts at the base of the nail (matrix) and extends through to the free edge. Like all skin, it is made up of dermis and epidermis. The nail bed contains thousands of blood vessels that carry food, oxygen, and nutrients to the fingernail. The nail plate is what we class as ‘a nail’. It has a densely packed surface, made of keratin. Several layers of dead, compacted cells cause the nail to be strong but flexible. These cells are not living, they are keratinised. The pink appearance of the nail comes from the blood vessels underneath the nail; the nail plate itself is translucent. The underneath surface of the nail plate has grooves along the length of the nail that help anchor it to the nail bed and to keep the nail growing in the correct direction. The purpose of the nail plate is to protect the living nail bed underneath. The lanula is the visible part of the matrix that resembles a half moon and should be treated with care as the cells have not yet fully keratinised. It is white in colour and opaque. The nail folds protect the nail matrix. The proximal and lateral nail folds are part of our skin. The skin does not end just there; it folds at the edges and continues beneath. The continuing skin acts as a protective barrier, it protects and seals the matrix against bacteria and dirt that is common within our environment. The matrix is the root of the nail. This area is not visible; it is hidden and protected by the proximal nail fold. The matrix produces keratin cells that make up the nail plate. As more and more cells are produced the older ones are pushed outwards and flattened, all this pushing and flattening results in the cells losing their original white plumpish appearance. They eventually become transparent and become part of the nail plate. The width and thickness of the nail plate is determined by the size, length, and thickness of the matrix, while the shape of the fingertip itself shows if the nail plate is flat, arched or hooked. The matrix is the most important feature of the nail unit. Damage to the matrix can cause permanent damage to the appearance of the nail.